When it comes to hiring a skip for your project, here at Britannia Skips we understand that some of our customers have particular needs. For example, builders may need a heavier duty skip than those clearing out rubbish from their home. That’s why we are delighted to offer our customers our 8 yard skips. 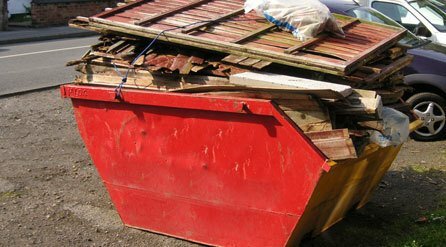 The 8 yard skip is perhaps our most popular skip for builders, as the heaviest skip that can tolerate heavy materials such as earth and concrete. Our 8 yard skip has a capacity of 8 cubic yards or 6 cubic metres – equivalent to around 100 large bin bags – with dimensions of 79 x 67 x 48 inches. While it is great for builders, our 8 yard skip also performs perfectly well at any other common applications. For example, it can be used for house clearance and light bulky content, or for all general building work that requires a lot of space. Once you’ve decided that you would like to hire an 8 yard skip we will aim to have it with you the very same day thanks to our same day skip delivery service. We will also be able to help you with obtaining the right council permit for the skip while giving you any other advice you need. If you’re not sure whether you need a smaller or larger model of skip than our 8 yard skip for your domestic or building project, please don’t hesitate to let us know. We’d be happy to chat with you to find out your requirements before agreeing the most appropriate solution.